A bowl sander uses the rotation of work on the lathe to drive a circular abrasive disc. Simple versions using a sanding arbor mounted in an articulated head on a handle have been around for some time, but these are prone to excessive wear on the spindle and the arbors need to be replaced regularly. This one from Charnwood is different. 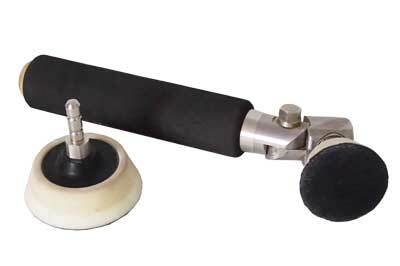 Machined out of aluminium, the soft foam grip handle is comfortable to hold, weighty but not too heavy, with an articulated head that is easily adjusted with the enclosed spanner. The head has a bearing mounted push fit socket for quick and easy changing of the arbor. Two each of both 50mm and 75mm sized arbors are included; these have closed cell foam backings that are significantly softer than others on the market and readily mould themselves to the curve of the work, regardless as to whether it is concave, convex or a combination of the two. I would have preferred to see the smaller arbor slightly undersized - as the larger one is - to prevent damage to the arbor's hook-and-loop face in use. The arbors are screw thread mounted onto their spindles and, because the direction of rotation is determined by the angle of presentation, you do need to ensure these are done up tightly to prevent them unscrewing themselves. 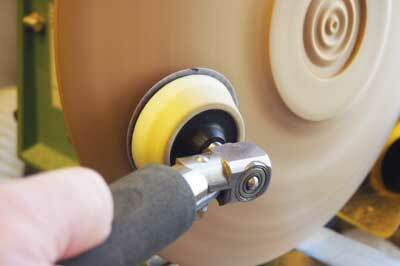 Bowl sanders are far more efficient than hand sanding and a lot quieter than power sanding. This is an effective and functional tool; it is significantly better than the cheaper, simpler, bearingless versions and well worth the modest price premium when compared to them.